Honestly, when we found Atlantic Food Bars and upgraded our deli area, the result was awesome. I’ve been in this business 35 years and I was very impressed with the stainless steel gauge and overall durability of the equipment. That, together with the made-to-order sizes and options of the equipment, gave us the ability to really maximize our space. The display it creates is clean and professional. So many compliments from happy customers, too! It seems that in today’s global economy, what’s made here in the US is less clear. American manufacturing is always our first choice, not only because it’s almost always better, but also because we know we’ll get the service we need when we have a problem. Atlantic has been great in the service department too. This entry was posted in Salad & Olive Bars, Testimonials on February 7, 2019 by Atlantic Food Bars. 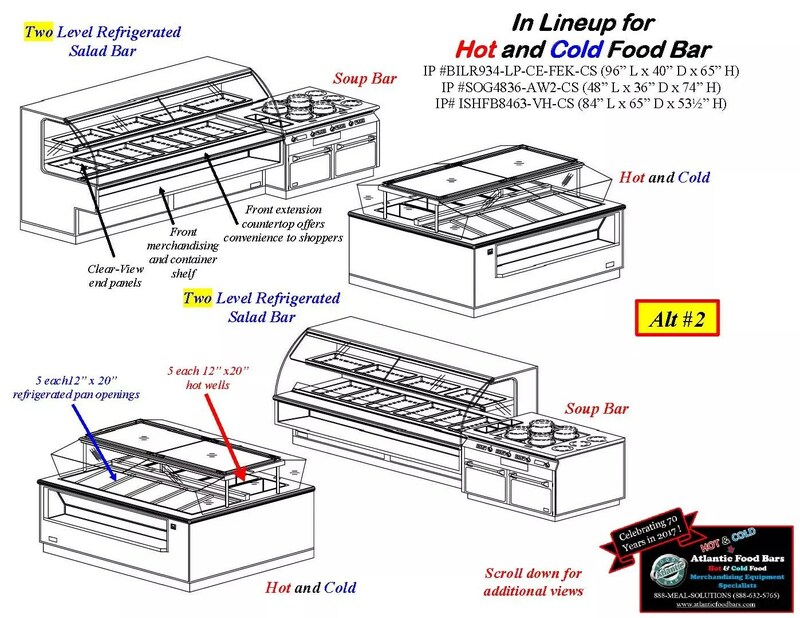 The hot food bars that we purchased are beautiful and working terrific, we’re all very impressed. Food quality and presentation has made this one of the more successful programs. 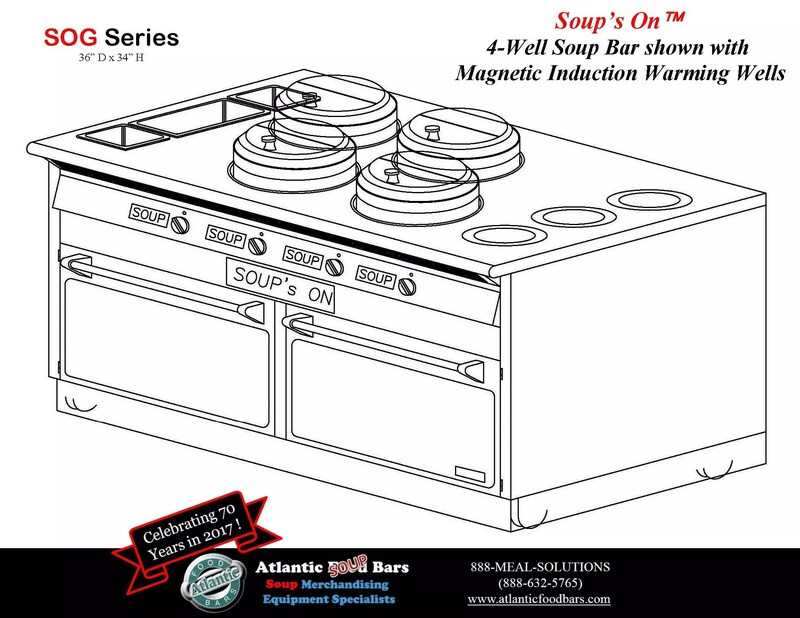 Every conversation regarding merchandising and selling of freshly made food begins with Atlantic Food Bars. 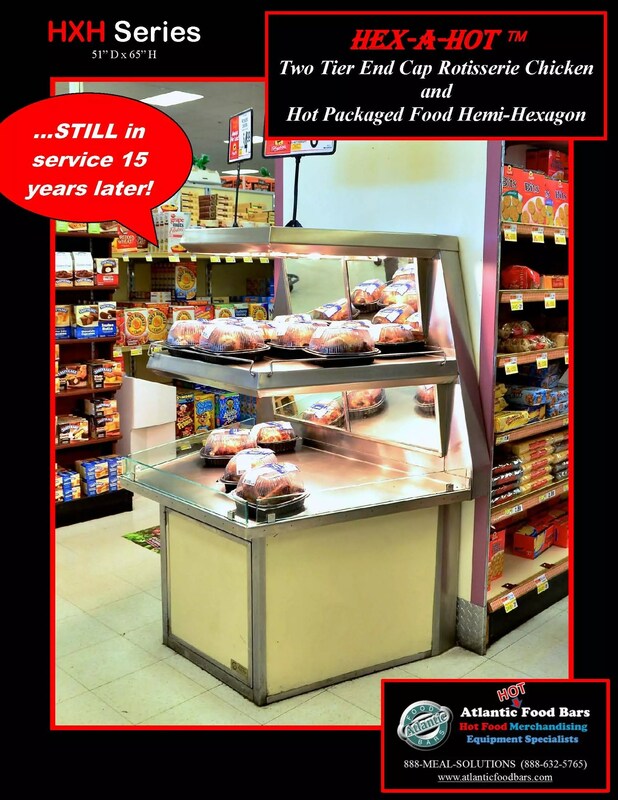 This entry was posted in Combination Bulk and Packaged Hot Food Cases, Hot Bulk Food Bars, Hot Combination Full and Self-Service Cases, Hot Packaged Food Cases, Testimonials on May 31, 2018 by Atlantic Food Bars. TESTIMONIAL – quick response and cut files are extraordinary! As always, your company’s quick response and cut files are extraordinary. One of your competitors did not produce drawing, stating that “if there was a real interest in buying the cases they would then draw something up” – guess what – they were immediately “Eliminated from the Race!”. You guys do the best job, like the LED option with no upcharge. Customers are loving it! 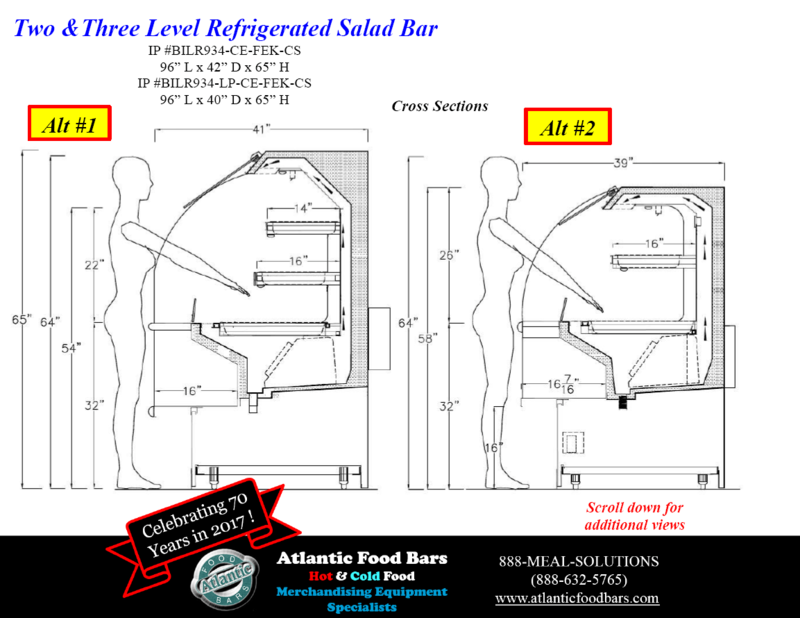 TESTIMONIAL – Atlantic Food Bars’ quick response and cut files are extraordinary! This entry was posted in Combination Hot & Cold Cases, Idea Factory, Salad & Olive Bars, Soup Bars, Testimonials on May 24, 2018 by Atlantic Food Bars. 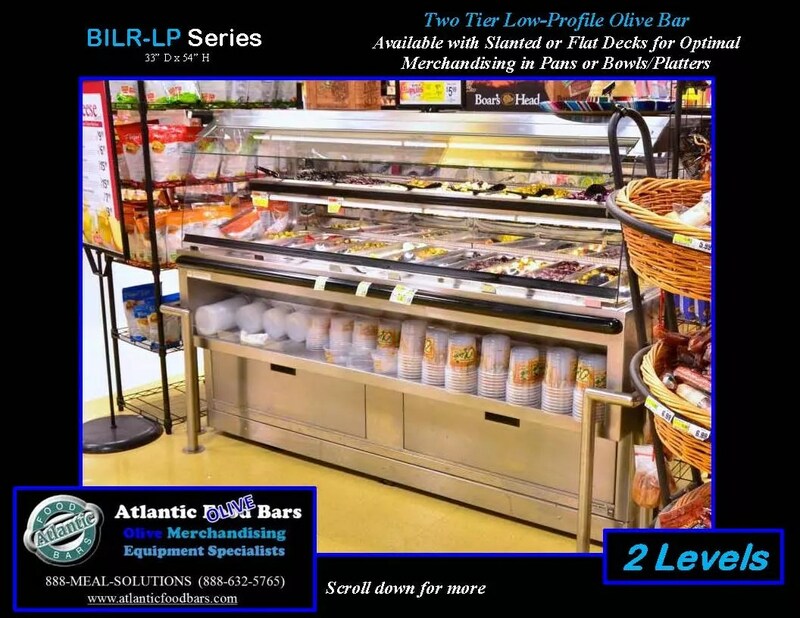 TESTIMONIAL – if I needed ten more mobile iced merchandisers, I would buy them all from Atlantic Food Bars! I searched Google for a fish display case and I am so happy that I found Atlantic Food Bars and their transforMerchandiser System. I loved how their website had pictures showing the mobile ice table being used for seafood and meat merchandising in different ways. It was exactly what our store needed because we can only sell seafood during half the year in our area. We’ve been using it for a year now and let me tell you, on top of being a brilliant idea in terms of flexibility, this thing is a selling machine! Customers line up to purchase by the pound – seafood in the summer followed by hot steam table dinner like chicken marsala, and we turn it into a meat carving station in between. It’s a small mobile footprint with so little opportunity for breakage or mishaps, so not only do I not have to worry about damaging an expensive $15,000 refrigerated case, I can roll this thing anywhere I want to sell just about anything. It still looks shiny and new, not rusted out like other stianless steel products I’ve bought elsewhere. If I had a need for ten more units, I would order them all from Atlantic Food Bars! 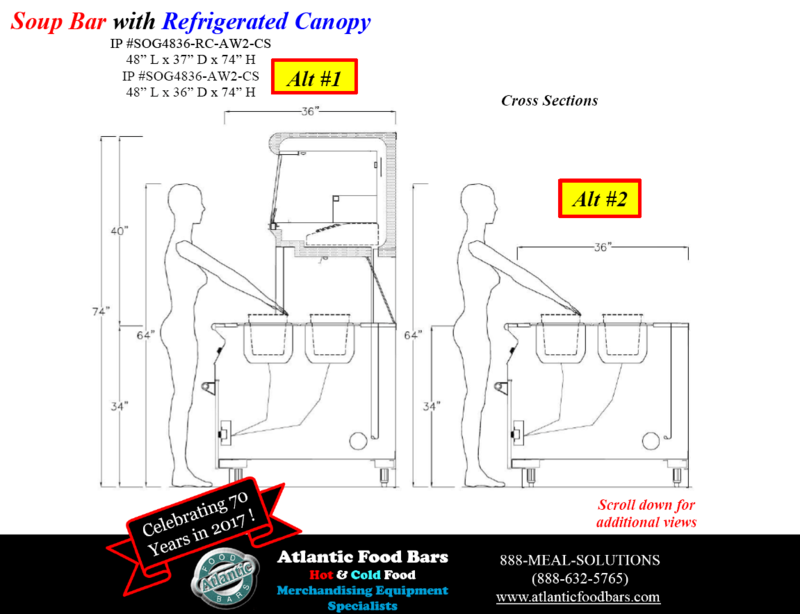 This entry was posted in Modular Mobile Ice Tables, Testimonials on May 17, 2018 by Atlantic Food Bars. 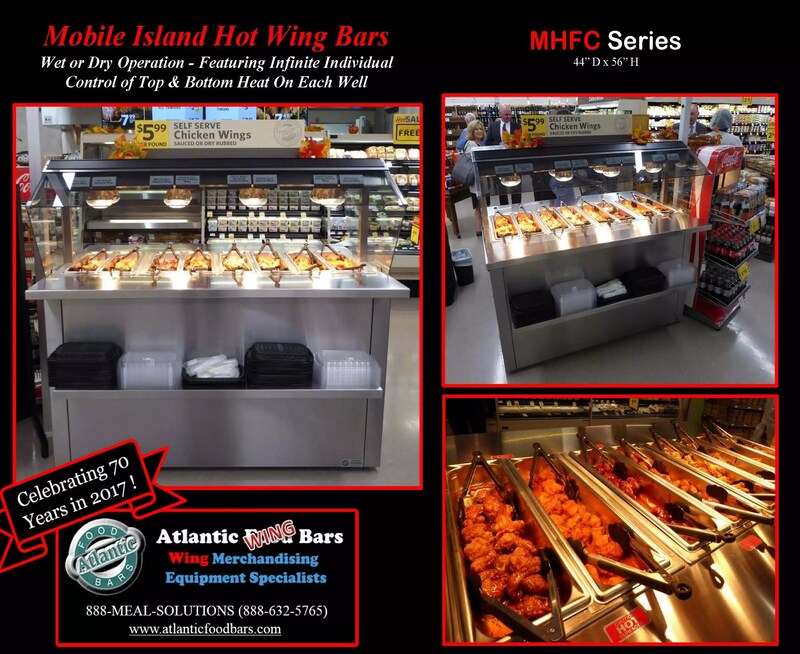 TESTIMONIAL – Tyson chicken wings FLY with Atlantic Hot Wing Bars! Our customers have been selling Tyson wings like crazy by adding hot wing bar programs to their merchandising efforts. Recently, one of our retail partners placed 30 Atlantic wing bars in their stores and saw a year-over-year sales increase in the category of approximately $5,000,000. You can only imagine the effects on their bottom line! 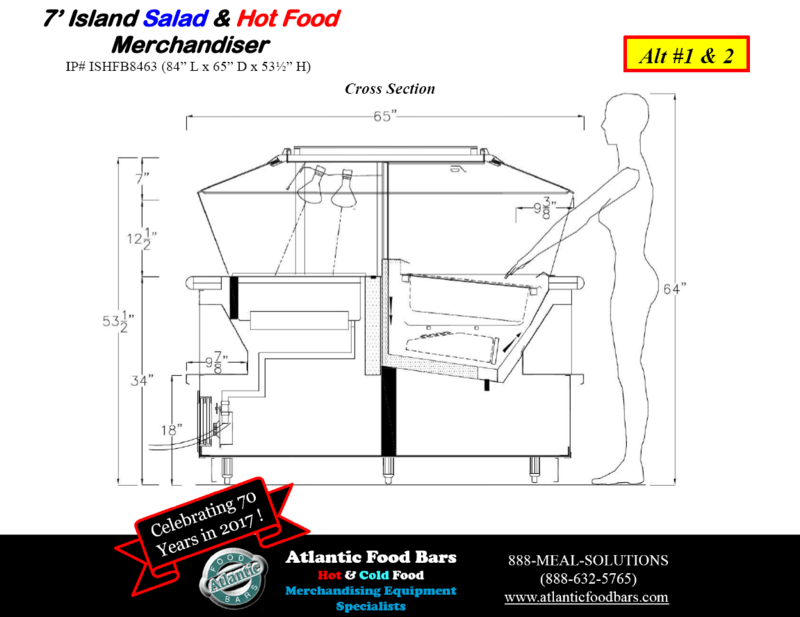 This entry was posted in Hot Bulk Food Bars, Testimonials on May 10, 2018 by Atlantic Food Bars. 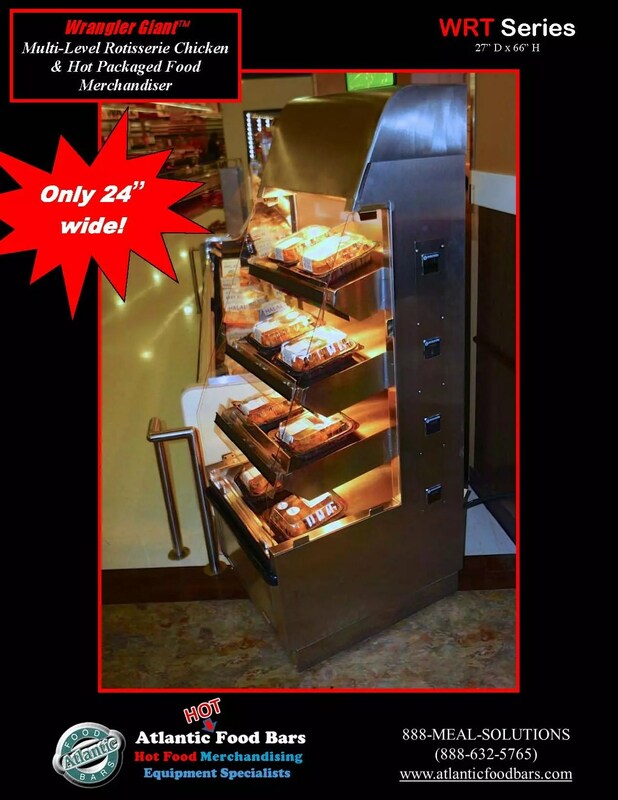 25 reasons why Atlantic HOT Food Bars is your only choice for hot food merchandising – click to see more! This entry was posted in Hot Packaged Food Cases, Testimonials on February 15, 2018 by Atlantic Food Bars. I would like to thank the AFB team for making this happen. The cases were received on-time, as ordered and have been installed for the grand opening. We are very satisfied. It is truly appreciated and will be remembered. Great job. 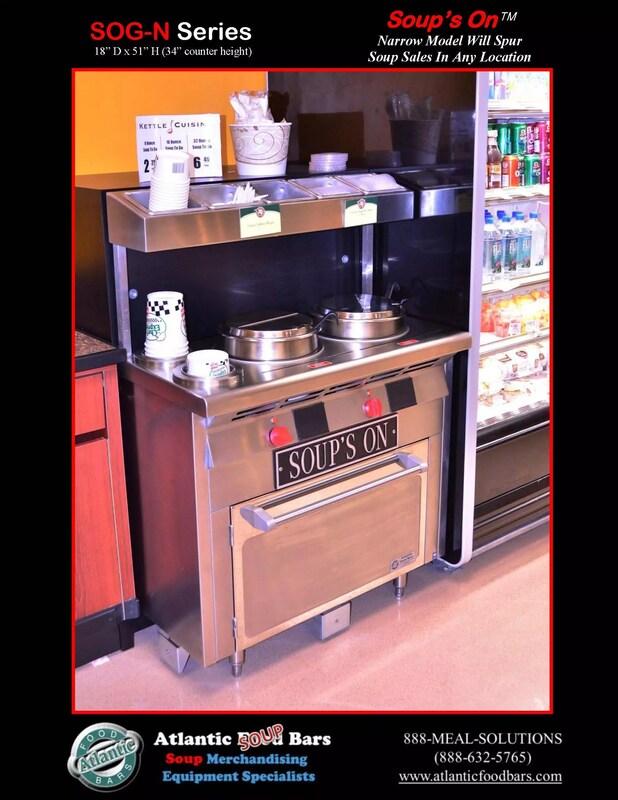 This entry was posted in Combination Bulk and Packaged Hot Food Cases, Soup Bars, Testimonials on November 2, 2017 by Atlantic Food Bars. 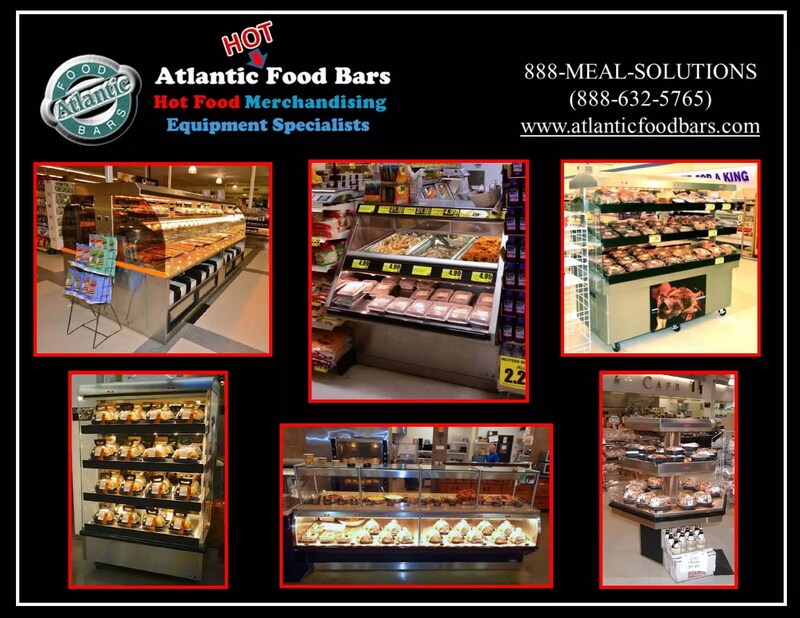 Atlantic Food Bars is our GO TO company for all of our hot food needs. 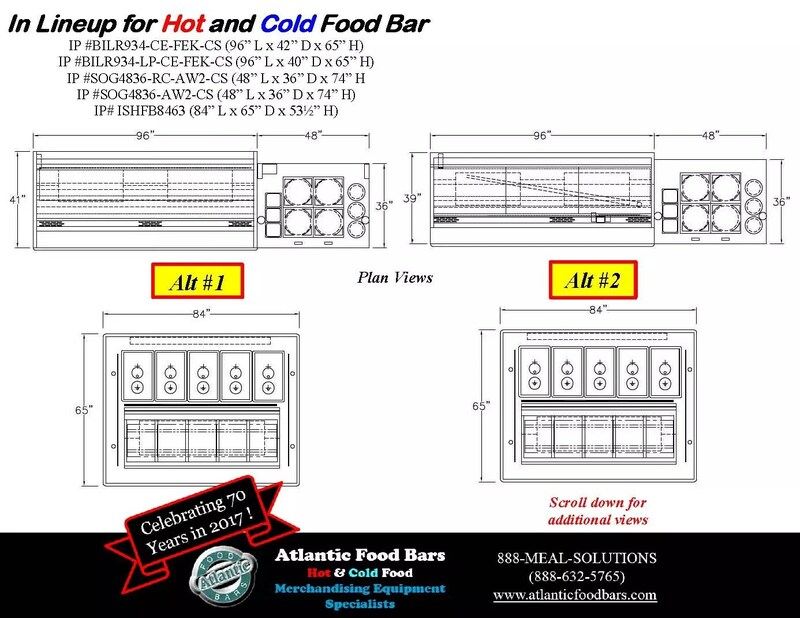 Last year when we wanted to try a new hot food concept, in less than 2 days, Atlantic Food Bars designed and engineered a custom case to meet our needs. 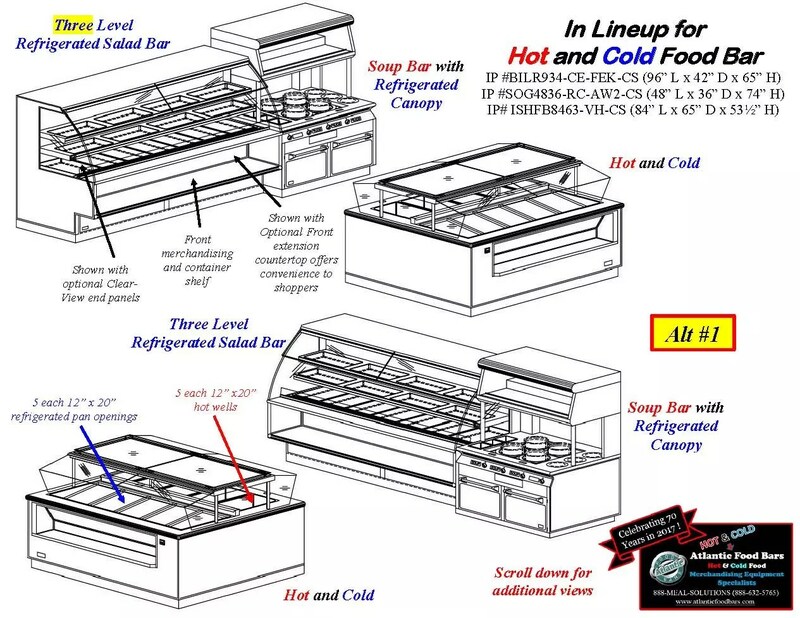 We have been so pleased with it, we are including it in all of our upcoming remodels and new stores and we just ordered a custom hot and cold sandwich prep and merchandising station. This entry was posted in Hot Packaged Food Cases, Testimonials on January 24, 2014 by Atlantic Food Bars. In 2012, I ordered 4 mobile ice tables for seafood merchandising and they did such a great job for us, I just ordered another one ! 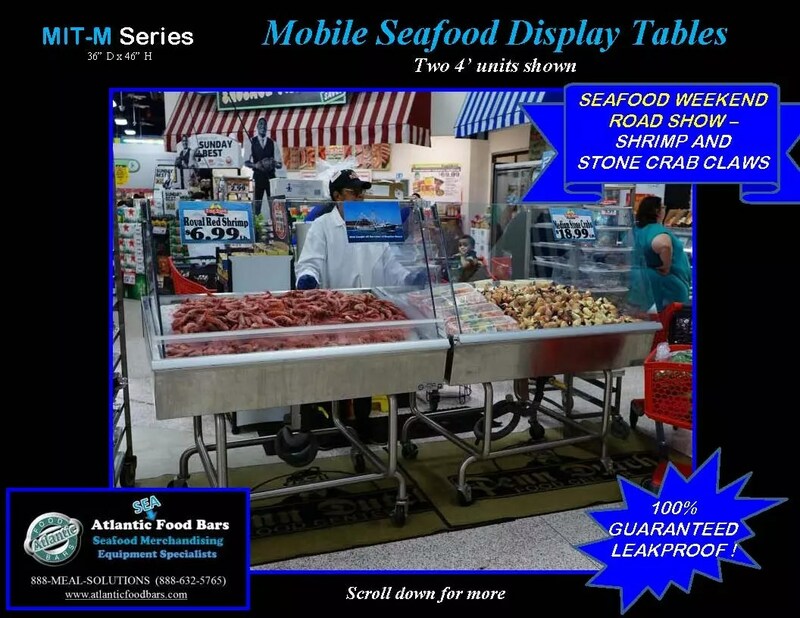 This entry was posted in Modular Mobile Ice Tables, Seafood Cases, Testimonials on January 23, 2014 by Atlantic Food Bars.